“The Right Honourable Sir John Alexander Macdonald, P.C., G.C.B., D.C.L.for nineteen years Premier of the Dominion of Canada. With thanks to the Dean and Chapter of St Paul’s Cathedral. Photograph 2011 and formatting by George P. Landow. Text by Landow and Jacqueline Banerjee. You may use these images without prior permission for any scholarly or educational purpose as long as you (1) credit the photographer and (2) link your document to this URL in a web document or cite the Victorian Web in a print one. Charles C. Hill, Curator of Canadian Art at the National Gallery of Canada, tells us that there was, naturally, some question about giving the commission to an Englishman: Canadians had wanted it to go to Hamilton MacCarthy of Toronto, who was an English sculptor of part-Canadian parentage, and who had already taken St John's death-mask and prepared a clay bust of him. 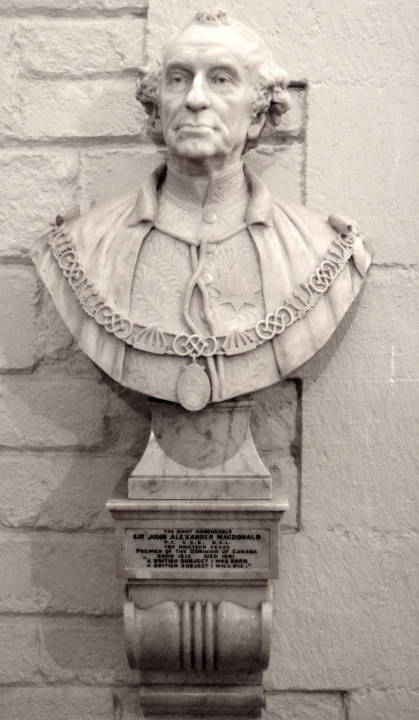 However, Lord Lorne (the Marquess of Lorne, Governor-General of Canada 1878-83) was particularly keen on Wade, and believed his bust of Sir John to be "the best I have seen." Hill also tells us that the inscription on the bust's supporting bracket ("A British subject I was born, A British subject I will die") was the slogan from Macdonald's last campaign. Hill, Charles C. "George Wade's Monuments to Sir John A. MacDonald." Journal of Canadian Art History XXII (2001): 6-25. Web. 3 August 2014.